Organizing With Old TV Armoires! Amazing Transformations! Do you have an old tv armoire that you do not use anymore and thinking of selling it or giving it away? If so, after reading this blog you may want to reconsider. There are many ways of refurbishing old armoires into functioning spaces! If you do not have a tv armoire, and would like one, you may want to check out your local consignment shop. Armoires are often being dropped off at consignment stores, and have been, ever since the beginning of flat screen televisions. Check out the following 6 amazing transformations of tv armoires! This Linen Closet is Fresh and Clean! Love it! Store crafts in this old tv armoire! Close the doors to keep it looking clean and tidy! This office is fun and stylish! Love the addition of wallpaper! TV armoire transformed into a change table! This bar is classy and functional! Add a mirror, porcelain shelf, wine rack shelf, and stemware hangers! This kids area is practical and unique! The chalkboard paint on the doors adds character and kids love it! via kidspacestuff.comThese are just a few ideas of how you can refurbish your tv armoires into functioning spaces. If you don’t have a kitchen pantry, you can always use your tv armoire for added kitchen storage. Or you can use a tv armoire as a clothes wardrobe. Add a pole and hang clothes. 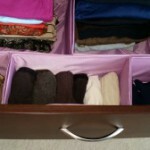 Use the drawers for clothes, belts, scarves and jewelry. https://www.secondsetofhands.ca/wp-content/uploads/2014/05/Organizing-Armoires.jpg 600 450 Kathy McEwan http://www.secondsetofhands.ca/wp-content/uploads/2017/12/logo-800x267.png Kathy McEwan2014-05-04 09:04:202018-01-30 18:43:26Organizing With Old TV Armoires! Amazing Transformations! 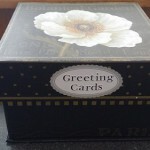 Quick, Easy and Inexpensive Ways to Organize Your Dresser Drawers Greeting Cards Box – So Easy to Make and So Organized!